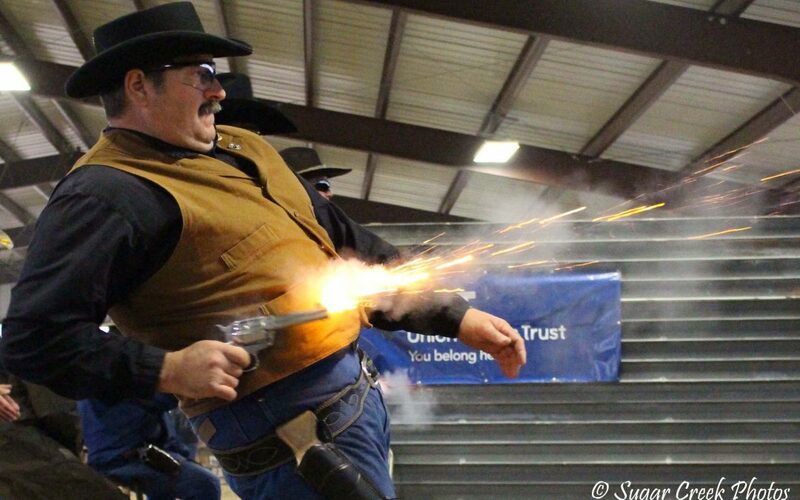 The Sparks Spurs chapter of the National Cowboy Fast Draw Association will host the Nebraska State Championship and the Great Plains Territorial Championship on September 14th through the 16th at the Cherry County Fairgrounds in Valentine. The members would like to thank the community for supporting this major event. This will be the 4th year the chapter has brought the State Championship and Territorial shoot to Valentine at the Cherry County Fairgrounds. Last year there were 84 contestants from 13 states plus many non competing spouses who attended. This year there could be more participants than ever. There will be a banquet and old west costume contest on Saturday night at the Peppermill. Shooters, both men and women, will compete against each other using real 45 long colt pistols with wax bullets. They shoot at metal targets from a distance of 21 feet. Fast times will be down around a third of a second. The public is invited to watch the shooting contests at the pavilion at the fairgrounds. Concessions will be available. Major sponsors include Union Bank, The Gun Cabinet, and Cherry County Visitors Promotion Board.